The role of National Cotton Council Chairperson can be a roll of the dice in some ways. The position comes with a single year term limit, and all years are not created equally. Some Chairmen inherit well publicized challenges – like Ron Craft, who took over in 2018 as the industry was staring down the creation of a new Farm Bill. You might think that this year’s chairman, Alabama producer and ginner Mike Tate, who was elected in February at the NCC Annual Meeting in San Antonio, would have an easy time of it then. That legislation was passed months ago, after all. But if you think he’ll be kicking his feet up for this term, you’ve got it all wrong. There’s the important task of implementing that new Farm Bill. Disaster relief will be a major objective coming off a tumultuous 2018 growing season. And, among a whole host of other challenges, there’s the volatile trade dispute playing out on the global stage, which the National Cotton Council will seek to impact positively in 2019. All of these important tasks might seem overwhelming for a single man or even a single organization. But Tate says the NCC has proved quite capable of affecting change over the years. That’s the reason he’s so excited to be leading the organization in 2019. “I followed in my father’s footsteps when it comes to involvement in associations,” Tate says. “I had opportunities to be involved in many different farm organizations, but what I saw with the National Cotton Council was an organization that has made the most difference for our farm,” he says. Still, the task of helping resolve the Chinese trade disputes – and, in doing so, bolstering demand for American cotton – is daunting. Tate, though, remains confident that the NCC can be a positive force in the ongoing fallout. “We’re in contact with the United States Trade Representative,” Tate says. 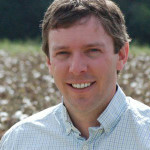 “(NCC Vice President, Washington Operations) Reece Langley is certainly in contact with them, trying to relay to them what’s happening in the cotton industry, what our issues are, and what kind of solutions we need to help our cotton industry. Like so many of his predecessors, Tate has been molded for his time as NCC Chairman by a lifetime spent in the cotton industry. Born in Huntsville, AL, Tate has been farming his entire life. His father grew his first crop in 1946, and Mike has farmed on and around that same patch of ground from the beginning of his career. He says he only ever left the farm for a brief stint to attend classes at Auburn University, where he set out to study agronomy. But Mike had 20 acres in production that first collegiate fall, and soon decided he’d be better served doing his schooling closer to the farm. So he enrolled at Alabama A&M – a mere five miles down the road from home. Tate Farms has always been a family operation. Mike was the oldest of four brothers, and together they formed a partnership in 1987. Since that time, there have been some changes in personnel, but the farm remains in family hands, as Mike works in conjunction with his brothers Jeff and Steve, as well as Steve’s son-in-law Stewart McGill, and a nephew, Hunter Tate. Today, cotton remains the principal crop in a sprawling 6,000-acre operation that Tate and his brothers have grown consistently over the years. In addition to production agriculture, Tate is also the president of Cotton Growers Cooperative Gin and Warehouse. He also has an interest in Tate Farms’ “Cotton Picking Pumpkins”, an agri-tourism operation that allows visitors to see how modern farming works. “When we started the pumpkin patch 22 years ago, we were trying to do two things,” Tate says. “One, we were looking for another revenue stream, which, surprisingly, worked out better than we imagined. But the second thing we were trying to do was to educate the public a little more about agriculture and give them an opportunity to be on a working farm. With his fingers in so many different ventures, it’s a wonder Tate has time to step away from the farm as often as he will be called to do during his year as NCC Chairman. There will be numerous trips – to places like Washington D.C. and eventually to China. Luckily, Tate has his trusted family members to look after things while he’s away. One of his objectives as NCC Chairman will be to represent the entire cotton industry – all seven segments of it – in his leadership capacity. “I’ve gotten to visit with every type of business from all sides of the industry – mills, warehouses, gins, manufacturers,” he says. “Through my work in things like the Cotton Leadership program and over the years being involved with NCC, I’ve gotten to interact with all segments.